Log into your server as system administrator either locally or remotely via Windows Remote Desktop program (or another RDP client). Make sure your server meets PageTypes system requirements. Download and run PageTypes Installer. 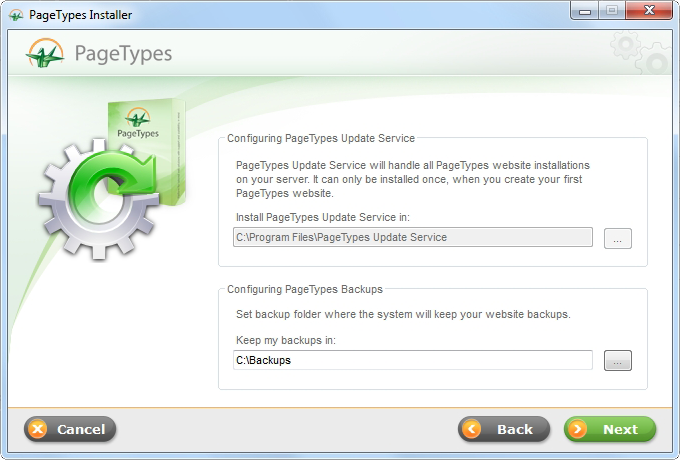 PageTypes Installer will connect to PageTypes repository server displaying the latest PageTypes installations available. Select PageTypes base installation or predefined template then press the “Next” button. Enter name for your website. Browse and select a folder on your file system where your website will be installed (usually C:\Inetpub\wwwroot\WebsiteName). Enter domain name (YourWebsite.com). By clicking "Check DNS Record" link, make sure your domain name is pointed to the web server you are installing website at the moment. The Installer will check the DNS information and will display the A record IP address. Specify port or leave it 80. Select IP address or leave it "All unassigned". recommended: select the IP address that your DNS A record is pointed at. Enter path to your database server. Specify database server authentication method. You can use windows authentication if your database and web servers are sharing the same machine. If you select SQL Authentication method make sure your database is configured to accept such connections also you must provide server administrative account "sa". Enter name for your website database. Enter public user name (to be created). This user name is to be used for database connection. Make sure the password is complex enough. 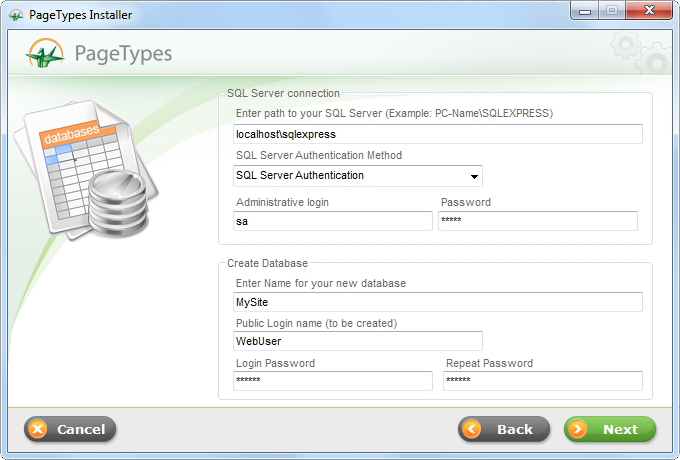 PageTypes Installer will raise a message if your password does not meet the SQL or Windows password complexity requirements. If you are installing PageTypes for the first time you will be prompted to specify installation path for the Page Types Update Service. Note that this service is taking care for all PageTypes installations on your server and it will be installed only once. Enter backups path. All PageTypes websites that you may have will be backed up at this location depending on the backup schedule you have created on each website administration. 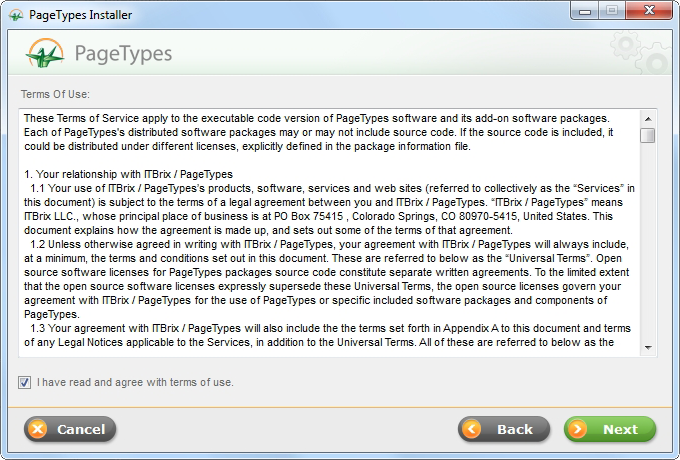 On the next step PageTypes Installer will display all the information collected. Press "Install" button to start the installation process or "back" if you need to change something. On the final step PageTypes Installer will provide you with user name and password for your new website administration. Important! When you login for the first time create a new administrative user account and disable the temp account provided.